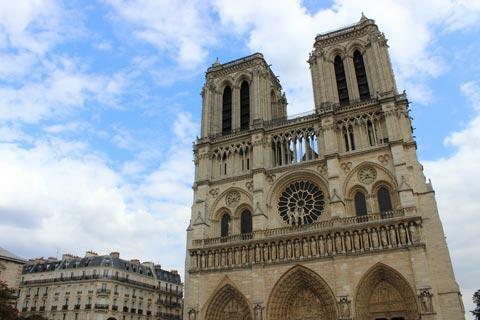 The Cathedral of Notre Dame de Paris is one of the most iconic examples of architecture in France. 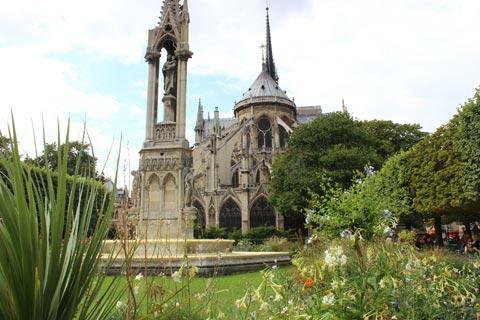 One of the first Gothic cathedrals ever built, it lies on the east side of the Île de la Cité, an island in the River Seine in the heart of Paris. The Towers of the cathedral are a listed National Monument. Start your visit along with thousands of visitors in the large square in front of the cathedral, called the Place du Parvis Notre-Dame. Originally this square was known as the Place du Paradis but the name changed with its prononciation across the centuries. 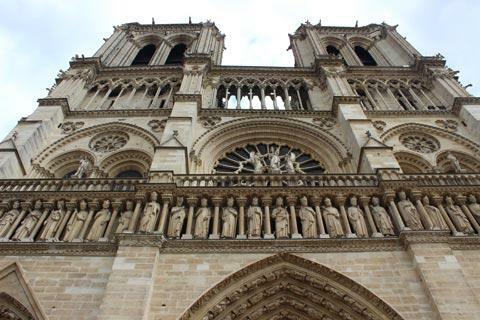 It was in 1160 that the decision to build Notre Dame was made, shortly after the Paris church became the central church for all kings of Europe. Bishop Maurice de Sully deemed it crucial that a newer, grander cathedral be built, and the old church on the same location was demolished. 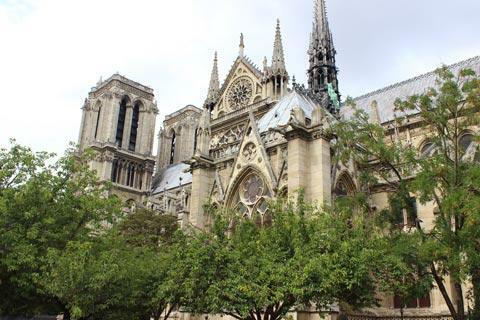 Three years later construction on Notre Dame began and even Pope Alexander III attended the ceremony where they laid the first cornerstone. Construction of the cathedral took almost 200 years, almost as long as the entire gothic period, and most would agree it is one of the most important examples of the Gothic style in the world. In architectural history, the cathedral of Notre Dame was one of the first buildings that made use of the flying buttress. These buttresses are the arches along the side of a church, supporting the weight of the walls and roof, and allowing the walls they supported to have large sections cut out of them to allow expansive windows. Although the buttresses were not originally part of the building plan, they proved to be necessary to make the building work and are now a crucial part of the cathedral’s look, and a key feature of other gothic cathedrals. 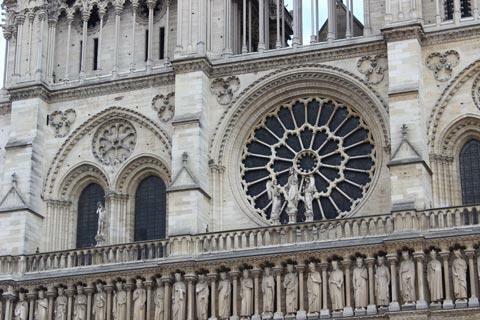 In the 1500’s, when the Huguenots - a reformist offshoot of the church - gained influence, they destroyed many of the windows of the cathedral that they deemed idolatrous. In the 1600’s a modernization movement also forced major alterations. During the 1700’s many of the cathedrals treasures were destroyed during the French Revolution. Excavations over the years have discovered that the area surrounding and beneath the cathedral also holds a great deal of history, with hidden rooms and cellars, furnaces, and other secrets. By the middle of the 19th century the cathedral was in very poor condition and in danger of collapse However, Victor Hugo’s book 'The Hunchback of Notre-Dame' renewed interest in the cathedral and saved it from being torn down – in fact, it inspired the campaign to raise money to restore the cathedral in 1845. The 20th century saw various attempts to restore and maintain the cathedral. 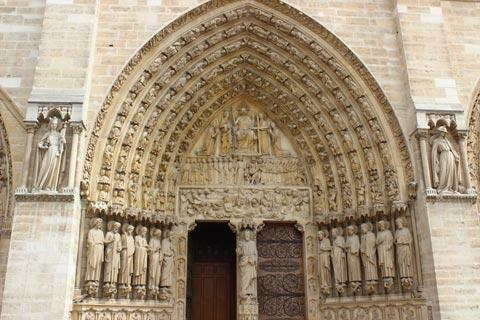 Most recently, a program started in 1991 to clean and revitalize the cathedral was completed in 2005.
the right portal is dedicated to Saint Anne and dates from 1170. Interestingly some of the sculpture on this oldest doorway is thought to have been reused from the church that previously stood here. Walking around the cathedral you can also see the impressive doorway on the northern side and the lovely architecture and spire to the rear of the cathedral. 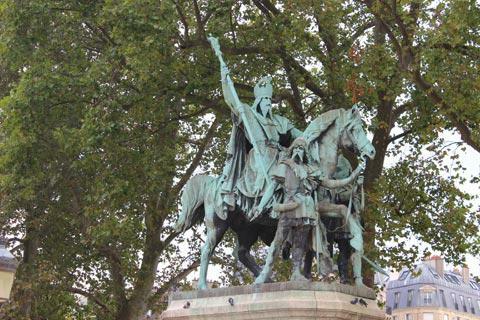 The statue in the Parvis to the right in front of the cathedral is a 19th century statue of Charlemagne. To the right hand side and rear of the cathedral you can also see small garden areas. There are two separate queues to enter Notre-Dame: the one to the front is to enter the main cathedral while a separate queue to the left of the facade is for access to the Cathedral Towers. The first thing you will notice when you enter is the great size of the cathedral and the layout, with the side aisles curving to meet behind the altar: this was quite original at the time although often copied later. In particular you will want to see the 14th century carvings from the life of Christ in the choir area and the three rose windows. Unfortunately most of the original stained glass windows were removed in the 18th century but these rose windows are magnificent and provide some compensation for the missing glass. 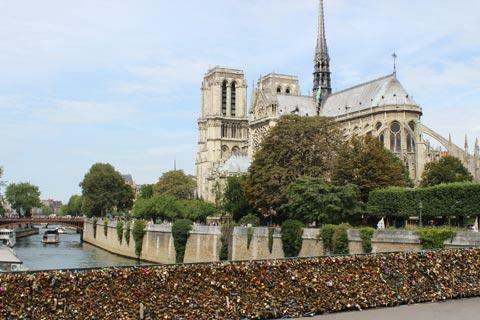 After admiring the interior of Notre Dame cathedral you can visit the towers, the most exciting part of your visit because of the famous bells and gargoyles and the views across the Paris rooftops. Also the most exhausting because you have to climb more than 200 steps to enjoy this splendour.